There was whooping. A man hollered. The air may or may not have been punched. An appalling cricket-related pun may have been deleted from the draft of this post. Yes, last Friday we were passed news that Roulette Cricket, a product we launched earlier this year for the eponymous startup, won second place (and a not-to-be-sniffed-at 50,000 euros) in Vodafone Mobile Clicks, a high profile competition to find the best mobile Internet startup in Europe. Having put a great deal of thought and sweat into the app over the last 9 months, we're absolutely chuffed; and we think that some of the principles underlying the app (its use of live data and unashamedly humble attitude towards being used as a "second screen") are interesting ones that you'll see a lot more of in coming years. There's a video which communicates some of the tension behind the final presentations and judging at PICNIC in Amsterdam here, and you can learn more about Roulette Cricket on their web site here, or in my blatherings here, or here. A week or two back we learned that of the 50 UK entries to the Vodafone Mobile Clicks competition, two of the 5 country finalists selected from the UK were our customers: Touchnote and Roulette Cricket. I've not written about our work for Touchnote here because it's all a little hush-hush, but you'll find out more soon, I promise. 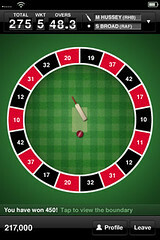 Roulette Cricket is a 2nd-screen gaming app which lets you bet on cricket games as they happen, from your iPhone. You can read more about it here and here. 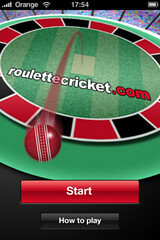 We launched an update to Roulette Cricket this week; lots of new features and a few tweaks. The previous version was pushed out in time for the IPCC matches and there were a few features we just didn't have time to squeeze in, which you can get now. The big one you'll notice is commentary: you can now read a ball-by-ball account of the match on your iPhone, as it happens. One of the things I like about the app is that it's designed for partial attention - as a second screen whilst you're at work, listening to the radio or watching television. This means that accounting for the moments you'll miss is as important as showing you the game live. To that end we also let you replay the last boundary, so if you're distracted when it happens, you can see it again. We also put in a few graphical twizzles and fixes, and a tweak around the display of times: where they used to be in GMT, they're now localised to your timezone. Cricket is an international game, pretending that everyone in the UK just didn't cut it. For the last few weeks, one of our offices has been resounding to the thwack of leather on willow. I'm pleased to announce that we received a note from Cupertino yesterday, informing us that our hard work has come to fruition: we've launched Roulette Cricket, an iPhone app which has kept one of our teams busy for the last couple of months. The founders of Roulette Cricket are genuine cricket fans, and have been playing this game themselves at matches for a little while, using paper plates and piles of coins; early workshops saw us all playing along to matches on Youtube, to get a feel for it... and then thinking about how to build on this experience for mobile. Since then we've been working closely with our customer to develop and refine the gameplay. As genuine enthusiasts, the RC team have been an unusually engaged customer; we've taken advantage of this to involve them very closely in their product development. They've spent a half-day at FPHQ every couple of weeks, during which our team have demonstrated progress from the previous fortnight and had feedback, we've looked at the big picture of the project as a whole, and planned in the coming fortnight of work. We've always made efforts to be transparent with customers, but having them in the room with the team has made a significant positive difference to the product, the process, and the relationship. 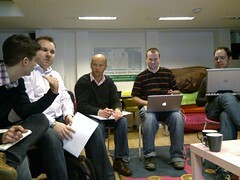 In future I'm looking forward to this style of collaboration being the norm for us, rather than the exception. There's a suite of game mechanics lurking inside the app, but a really interesting aspect of the product is its use of live data - in fact the game can only be played live. We've long felt there's something interesting about mobile as a second screen for broadcast or events, and in many ways this feels like a natural progression of the work we did with the Ghost Detector in the US a few years ago. We think there's a lot of mileage here, and you'll be seeing a lot of activity in mobile as a second screen in the next few years. You'll notice that what we've launched is "Roulette Cricket Lite"; there's more to come and we're beavering away on the next release, which will bring a load more features and refinements. In the meantime, we and Roulette Cricket are very interested in feedback from players; so please do download, have a game, and let us know what you think! Kudos must go to the folks at FP who've been putting their heart and soul into this for the last few months: Douglas Hoskins, James Hugman, John Revill, Ben Carias, Trevor May, and Sergio Falletti.